Do you love yogurt and spend too much at the grocery store buying ready-made flavored yogurts that are too sweet, too rich and too expensive? Well, what about making your own? Fresh, all-natural, homemade yogurt. Inexpensive, healthy and, best of all, made to order. Sounds perfect. But if you have tried to make yogurt at home without a yogurt maker, you know that, while simple on paper, when you get down to it, it is often less-than-desirable. It could be too loose. It could develop a strange smell. And you will end up checking on it multiple times to keep those things from happening. But the Salton Yogurt Maker takes the fuss, the worry and the effort out of the process. Your yogurt will come out beautifully every time---if you follow the instructions carefully. Heat the mixture in the saucepan on medium, inserting the candy thermometer. Stir constantly to prevent sticking. Keep checking the temperature of the mixture until it reaches 185 to 195 degrees Fahrenheit. Do not let the temperature go higher than this (or it will boil). Remove the saucepan and let the liquid cool to about 110 degrees. You can put the saucepan in the refrigerator to speed up the cooling, but if you do, be careful not to let the temperature drop any lower than 100 degrees, or you will have to start over. When the mixture is lukewarm, stir in either 1/2 cup of plain, unflavored yogurt or one packet of a yogurt starter culture. Allow the mixture to culture for at least four hours, but no longer than 10. The yogurt will become more tart the longer it is left in the unit. Remove the yogurt container and either cover it and place it in the refrigerator, or pour the yogurt into another container with a lid. Store in the refrigerator for a few hours before serving. Homemade yogurt will last for up to one week stored in the refrigerator. 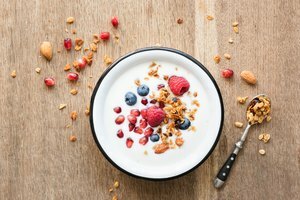 Imagine all the add-ins you can use to make your homemade yogurt breakfast or snack delicious: any kind of fruit; any kind of cereal; flax seeds, wheat germ; sweeteners such as honey, maple syrup, agave nectar, molasses, etc. 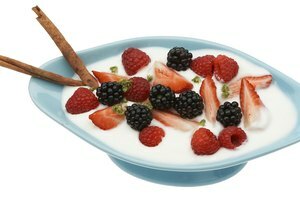 You can find wonderful savory uses for yogurt in many types of cuisines---Greek (tzatziki), Middle Eastern (labni, Turkish chicken kebabs) and East Indian (chaas, Tandoori chicken, yogurt rice), for example. Yogurt is practically interchangeable with sour cream and is excellent in baked goods, such as corn bread. Consider using your homemade yogurt to make yogurt cheese. 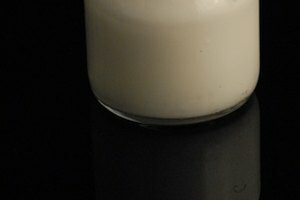 What about other types of milk, such as goat's milk (for a rich, caramel flavor) or soy milk (for vegan cuisine)? Frozen yogurt, anyone? When can you substitute Greek yogurt for heavy cream?